Shoes are something every family has — and in bulk. They’re a necessity. They’re an accessory. But how in the world do you store them in a way that’s both convenient and attractive? If your family is like most, you’ve struggled with this question repeatedly over the years. Whether your home features a mudroom or an entry way, a foyer or a front porch — where do the shoes go after a long day out on the dirty, dusty town? 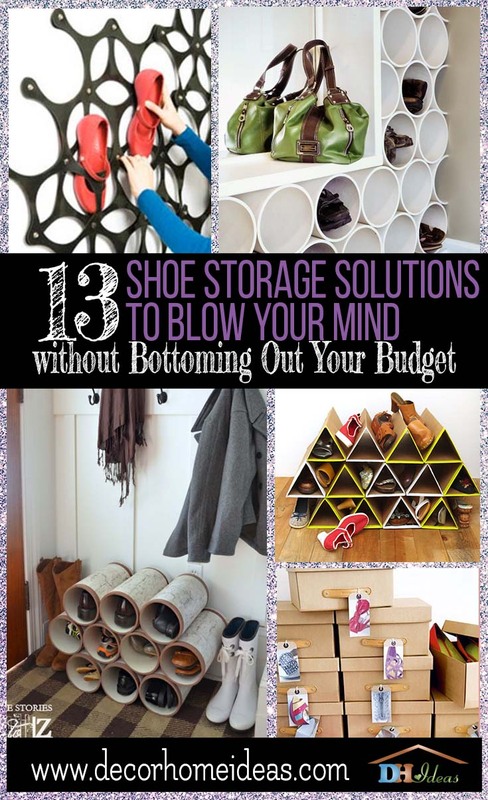 Our 13 shoe-storage solutions will blow your mind without bottoming out your budget. Go vertical, use the floor, or tuck things neatly away where no one will ever see, using a combination of shelving, cleats, pyramids and drawers. 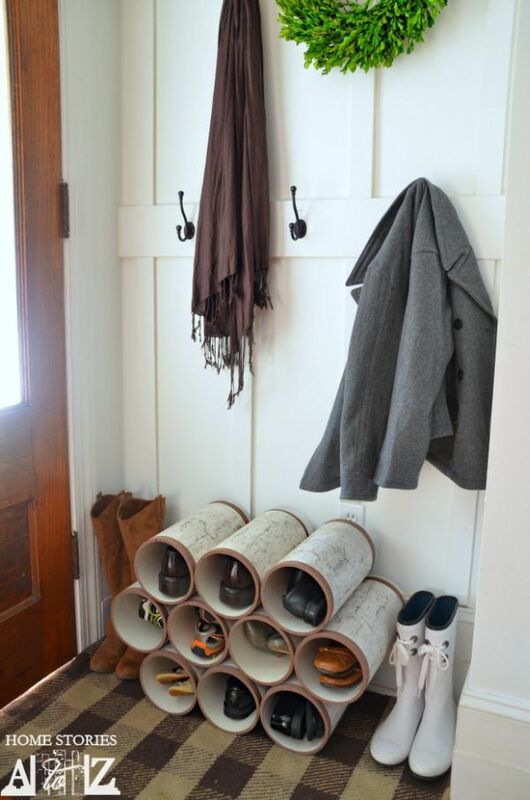 Organize your entryway and get family members to the car quicker using these 13 well-crafted ideas for storing your family’s footwear. Got plenty of wall space? Put some of those wide-open areas to good use as organizational tools to help keep wayward shoes at bay. 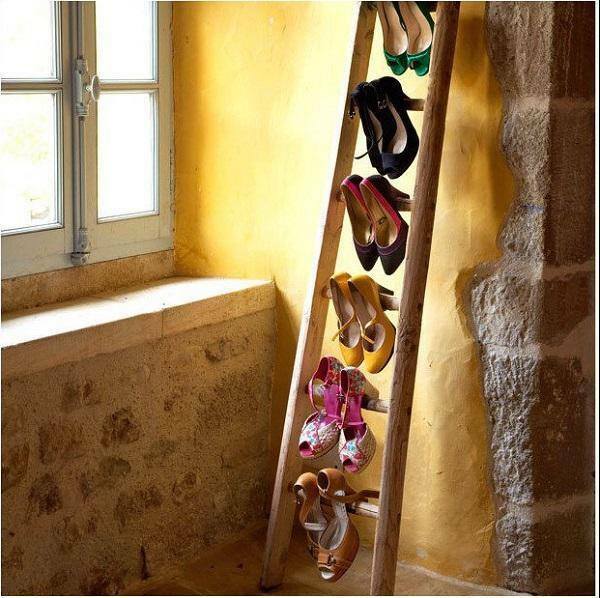 Our simple wooden shoe rack is the ultimate in minimalist design and makes your shoes the stars of the show. Mounted low on the wall, this nifty little hanger holds four pairs of favorite footwear, keeping them close by and convenient for those days when time is a luxury. Not enough storage space? Mount several — one above the other — to double and triple your storage. Use the space above these sleek storage racks to hang coats, jackets, hats and purses, and you have a cute little corner that’s well organized and easy on the eyes. It will get you out the door in a hurry too. You’ll never again forget your umbrella or leave your scarf behind when you give this design a go. And if you like the idea of using up extra vertical space to keep floors uncluttered, you’re going to love our next, more artistic, take on wall storage. Is it art, or is it organization? Your guests will find it hard to choose between the two when you opt for our soft, leather design that turns your favorite, fashionable shoes into wall art. Easy to use — simply slip shoes inside the flexible webbing of this statement piece, and you have organization for miles. Not to mention, the modern, abstract design is a real conversation starter. No more tripping over random piles of shoes stacked in the corner when you utilize this unique idea for keeping them contained. But if you’re running low on wall space, never fear, we have unbeatable shoe solutions for floors too. And they’re clever and convenient to assemble. What could be easier than a shoe rack made from — cardboard? Ah, but it’s not just ugly boxes stacked together that gets us going. This easy-to-assemble shoe solution incorporates pleasing geometric shapes to tuck shoes snugly away. This ingenious little design hold 12 pairs of shoes without looking cluttered. It’s the perfect solution for kids’ rooms and entryways, and you can save money by making this one yourself using nothing more than cardboard boxes and decorative duct tape. It’s a storage solution the whole family will love, and it won’t break the bank either. Looking for another shoe solution that’s ridiculously cheap and easy? You’re going to love our industrial option. Have you been searching for ways to incorporate that sleek, industrial look that’s all the rage? Our shoe rack made from exposed steel pipe might be the answer. 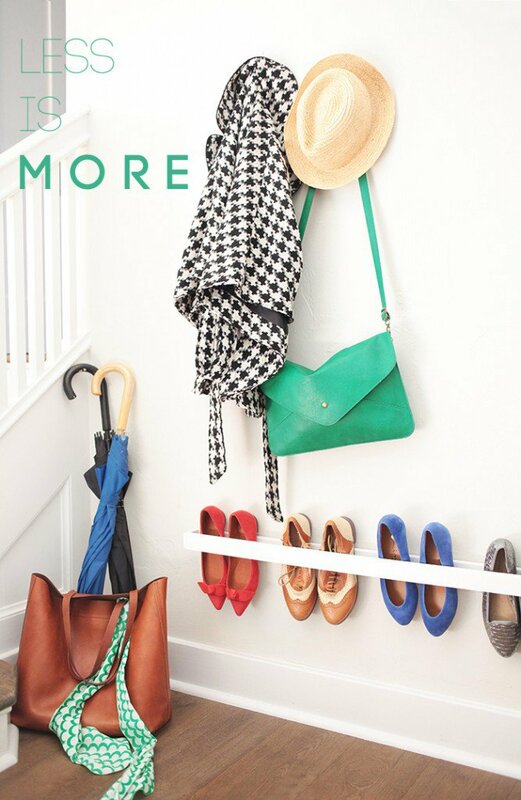 This idea takes that open piping that’s an eyesore in so many homes and builds upon it as a functional storage solution for everything from shoes to books. Don’t have this type of exposed pipe lining your walls? Don’t fret — this look is easy enough to recreate with one simple trip to your local home improvement store. 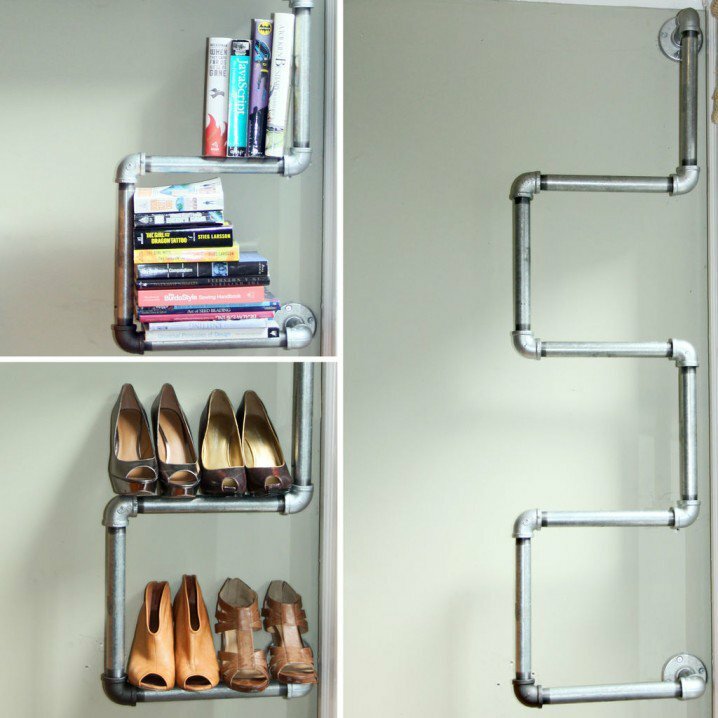 Steel pipe, fittings and hardware are all you need to build this one-of-a-kind shoe storage solution that’s attractive and that functions like a well-oiled machine. But if you’re less industrious and more French Country, check out our next option that’s off the scale for both pretty and practical. Looking to combine comfort with convenience? Our bench and shelf storage combo offers the perfect organizational mix to make getting in and out the door quick and painless. Combining a wall shelf with basket cubbies, a row of hooks for hanging coats and hoodies, and a comfortable bench with tons of shoe storage, this is one corner the whole family will find functional and fun. And the fact that it’s pretty is important too. If you’re someone who loves the laid-back look of French Country, our bench and shelf combo idea might be just what you’ve been needing. But if it’s modern and sophisticated that’s more your style, check out this next idea that offers a whole new use for PVC. Tired of going round and round with wayward shoes? Our next idea puts all that fuss behind you using what else? PVC pipe and a little decoupage. Pick up a section of this versatile piping and have it cut into ten small lengths that fit shoes perfectly. Sand the edges, then cover with your favorite artwork or fabric. 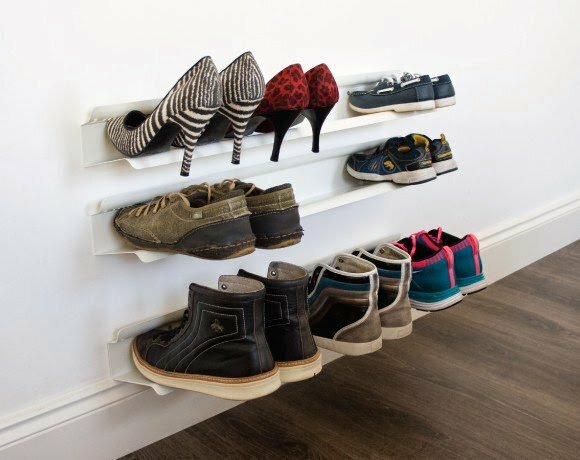 Glue the whole thing together in a pleasing arrangement, and you have instant shoe storage that looks high-end and stylish. Shoes slip easily in and out of these waterproof, plastic tubes for instant access when you’re in a hurry. Expand on this idea with our next option that makes getting dressed from shirt to shoes ridiculously easy. 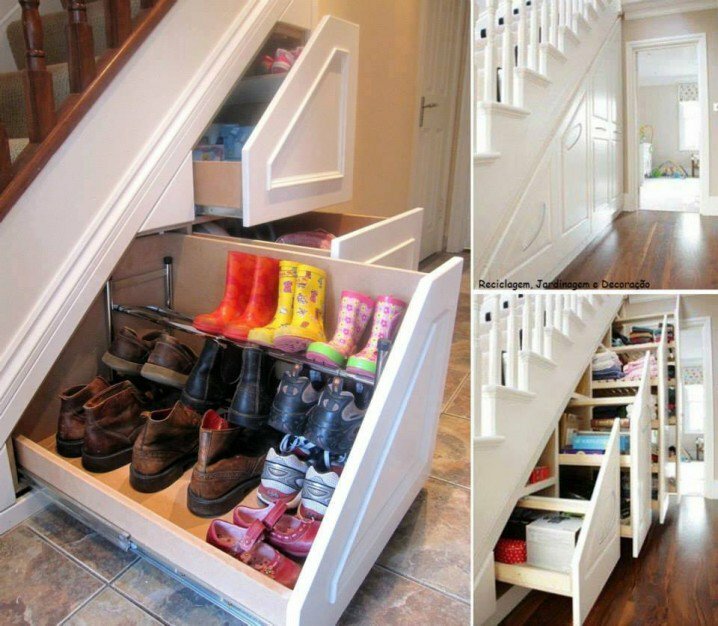 Want to mix shoe storage with functionality? Try out our take on this shoe rack/mirror combo. PVC piping once again saves the day, and when you mount it under and around an oversized mirror, you have the perfect dressing room accessory. Store tons of shoes this way, whether they’re little girl ballerina slippers and dress-up heels or your favorite everyday pumps. Get dressed and go with this sleek design that fits with any decor scheme. The wide shelf offers superb storage for purses, folded sweaters and book bags. Too complicated? We have just the opposite option coming up next. Have more empty shelving than you have wall or floor space? Go for the obvious — storing shoes inside the boxes is always workable. And if your shelving is open, try purchasing decorative shoe boxes that add to your room’s design. We kept our boxes neutral colors to match any decor and added decorative tags to designate which shoe is which. It’s economical, it’s simple, and it provides superior protection for shoes. Up next — Cute, not cluttered. What’s cuter than a princess and her dainty shoes? Our individual shoe holders are perfect solutions for your royal highness. Mounted to the wall singly or in pairs, these small, plastic cubbies each hold a single pair of shoes. When her footwear is too cute to hide away, try this technique that’s both affordable and fun. Mount holders in a simple up-and-down array, or get fancy and make a design. Either way, it gets small shoes up off the floor and keeps them in good condition. Need storage for footwear that’s less-than-pretty? See our next ingenious idea that’s perfect for work shoes and rain boots. Got ugly shoes? Our under-the-stairs storage is the perfect answer. Sometimes you need a place that’s quiet and tucked away — especially when you’re hoping to hide unsightly work shoes and hiking boots away from the public eye. Our convenient, pull-out drawers are just what you need. Pull them out, and you have storage options for miles. Tuck them away, and no one will be any the wiser. It’s the right thing to do when your family’s shoes are more functional than they are fabulous. Up next — every minimalist’s dream shoe storage. Who knew a simple ladder could provide multiple functions? Lean it in the kitchen or bath to hold your favorite collectible linens. 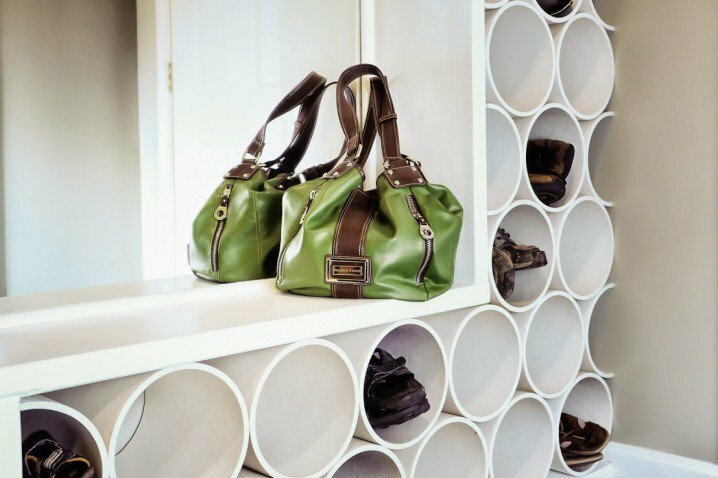 But when you display in the entryway or bedroom, it becomes spectacular shoe storage. Ladders like the one we used abound at flea markets and garage sales. 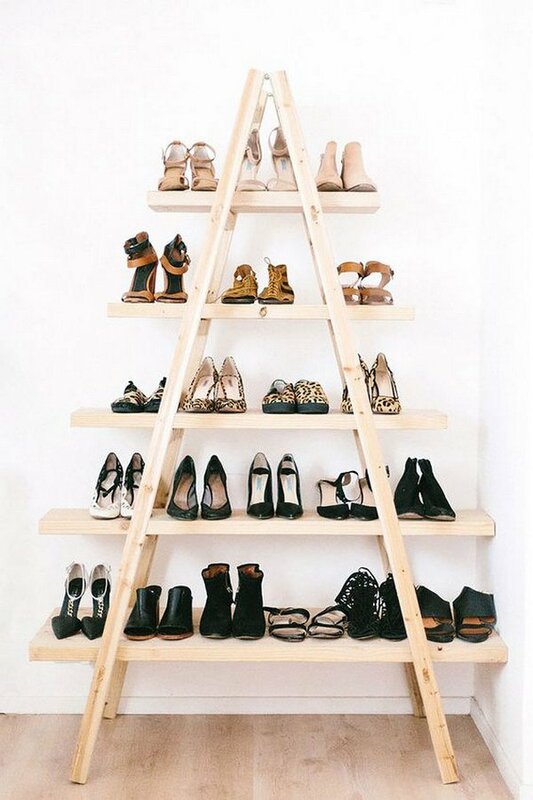 Pick one up for nearly nothing and put it to good use when it’s time to store your favorite heels. You don’t even have to mount it — just lean and fill. How easy is that? And you can take ladders one step farther by trying out our next idea that holds tons of family footwear. Thought stepladders were just for climbing? Not anymore. 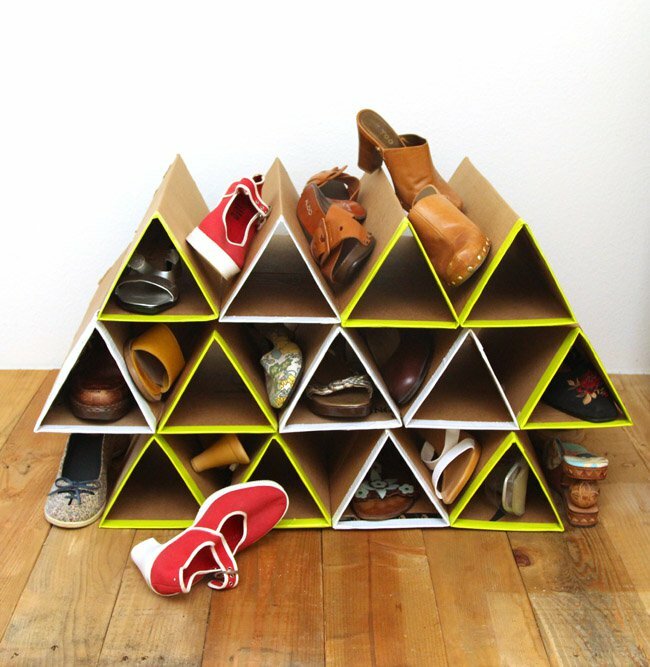 We used ours as the framework for a shoe storage solution to rival all others. Simply set your step ladder up in an unused corner and place pine wood shelving over each set of rungs. Voila! Instant shoe storage. It’s inventive, it’s practical and it holds every shoe your family can find to throw at it. An economical choice of storage solution, this one is easy to assemble using materials you probably already have around the house. Nice, but too heavy? We have the shoe storage solution to end all shoe storage solutions, and it’s completely discreet. Are you more interested in unobtrusive than you are in artsy? You’re going to love our simple metal cleats that anchor to any wall to hold shoes by the toes. Painted the same color as the wall, this storage option is all but invisible to guests and passers-by until they’re up close and personal. It’s an optical illusion that both invites conversation and keeps shoes up off the floor.